It was near the end of the US First Lady’s surprise visit to New Zealand to meet American forces based in the country, inspect the work of the US Red Cross – whose grey uniform she wore throughout her seven-day stay – and study the contribution of New Zealand women to the war effort. The most high-profile presidential spouse to that time, she was known for her concern for the downtrodden and for the rights of women. After flying in to Auckland on 27 August, Roosevelt travelled by overnight train to Wellington, where she received a heroine’s welcome (a highlight was an all-woman meeting in the Majestic Theatre). Next stop was Rotorua, where she was honoured by being allowed to speak on the marae at Ōhinemutu. Back in Auckland she attended a civic reception, visited the naval hospital and the Red Cross and Allied Services Clubs, and dropped in to the Red Cross dance in the town hall, where Artie Shaw’s band was in full swing. 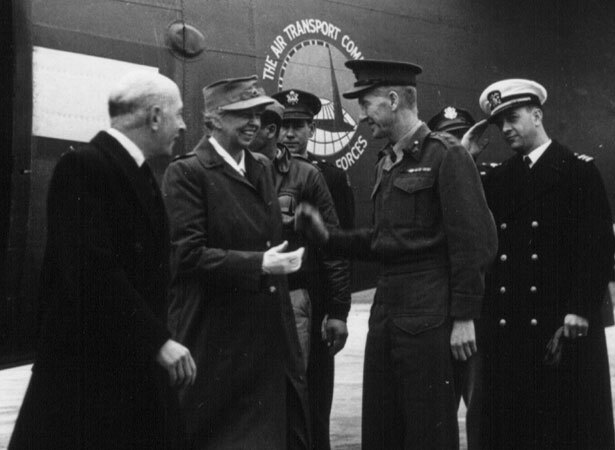 Eleanor Roosevelt left New Zealand on 3 September for Australia and the Pacific. We have 2 biographies, 1 article, 1 comment related to Eleanor Roosevelt visits Auckland .